In the aftermath of another civilian death at the hands of an allegedly intoxicated off-duty officer, Police Commissioner Bill Bratton says drunk driving cops are not a problem at NYPD. Nicholas Batka, 28, drove onto the sidewalk at Bedford Avenue and North Eighth Street in Williamsburg at around 3:10 a.m. Saturday, striking Andrew Esquivel and three friends. Esquivel, a 21-year-old student, was killed. The other victims were all seriously injured. Batka jumped into the passenger seat and claimed he wasn’t driving, according to reports, and bystanders had to surround his SUV to prevent him from fleeing. Court records said Batka “had bloodshot eyes, slurred speech and the odor of alcohol on his breath,” the Times reported. A transit cop who had been on the force less than two years, Batka was due back on the job at 7 a.m.
Batka was charged with assault, manslaughter, homicide, and driving while intoxicated. 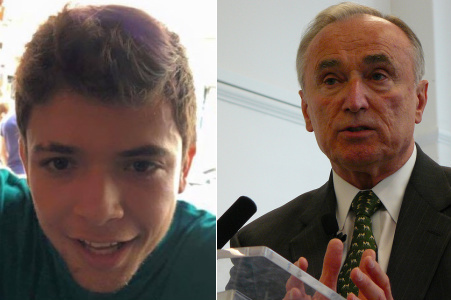 On Wednesday Bratton said that Batka had been fired. According to the Times, two other officers who were with Batka before the crash had their guns and badges taken as investigators look into whether they drove drunk that night as well. Though Bratton said “drunken-driving episodes” involving NYPD officers occur around three times a month and that the department would take a “closer look,” he played down the issue. 2013: Officer Joseph McClean struck and killed pedestrian William Hemphill, 51, in Staten Island. The crash happened at 6:18 a.m., six hours after McClean had ended his shift at the 121st Precinct. McLean was charged with DWI and manslaughter. The outcome of the case is unknown. 2011: Two drunk off-duty NYPD officers crashed vehicles on consecutive nights, on the BQE and the Upper West Side. 2010: Three off-duty officers were arrested for driving under the influence in 11 days. Raphael Ospina, whose brother said he was a habitual drunk driver, flipped a car on the sidewalk outside Tiffany and Co. in Midtown, causing several injuries. Ospina was convicted of assault and sentenced to six months in jail. 2009: Officer Andrew Kelly killed Vionique Valnord as she tried to hail a cab after a wedding in Brooklyn. Kelly, reportedly driving with at least one other off-duty cop in his SUV, pled guilty to manslaughter. 2009: Detective Kevin Spellman struck and killed 70-year-old Drane Nikac in the Bronx. Spellman, who according to prosecutors had a history of DWI crashes, one while driving a police vehicle, was found guilty of manslaughter. 2009: Homicide detective Timothy Duffy slammed into a garbage truck on the BQE, killing himself. Duffy, who lived on Long Island, was reportedly drinking between shifts. After Duffy’s death, police union reps suggested NYPD alter detectives’ shift assignments with an eye toward reducing drinking and driving during off-hours. It’s unknown what measures then-commissioner Ray Kelly took in response, if any, but he never publicly acknowledged the extent of NYPD’s drunk driving epidemic. Rather than take responsibility for the problem he inherited, and promising concrete steps to prevent more injuries and loss of life, Commissioner Bratton is denying the problem exists. This one is the most disturbing. How many criminal convictions is it necessary to acquire before one’s employment as a police officer is ended? Three a month that are caught (and not let off as a “professional courtesy”). Actual numbers are obviously substantially higher. Baffling that the Times didn’t press Bratton on this point. Infuriating but maybe not baffling. The NYTs likes the establishment and the NYPD as much as anyone. Yah, people were talking about ticketing the bar for serving Batka after he was drunk. But, would you feel comfortable cutting off up to 3 cops? I don’t think so. Scary! Talk about the fox guarding the hen house.